If you met me one year ago and asked me about the differences between skin care and make up, I would totally go blank and reluctantly answer “err.. make up is something with colour?” But, for some reasons (that are too long to write), since last September, I’ve started to aware about the very existence of skin care and I’ve been piling my knowledge on it. To be noted, I have a very sensitive combination skin (very dry in cheeks areas and very oily in T zone) and basically, for years, I hadn’t used anything except facial wash and a very light moisturiser. I didn’t dare to use anything beyond that, because my skin would break out (I had struggled with acnes), become red, or have rashes. 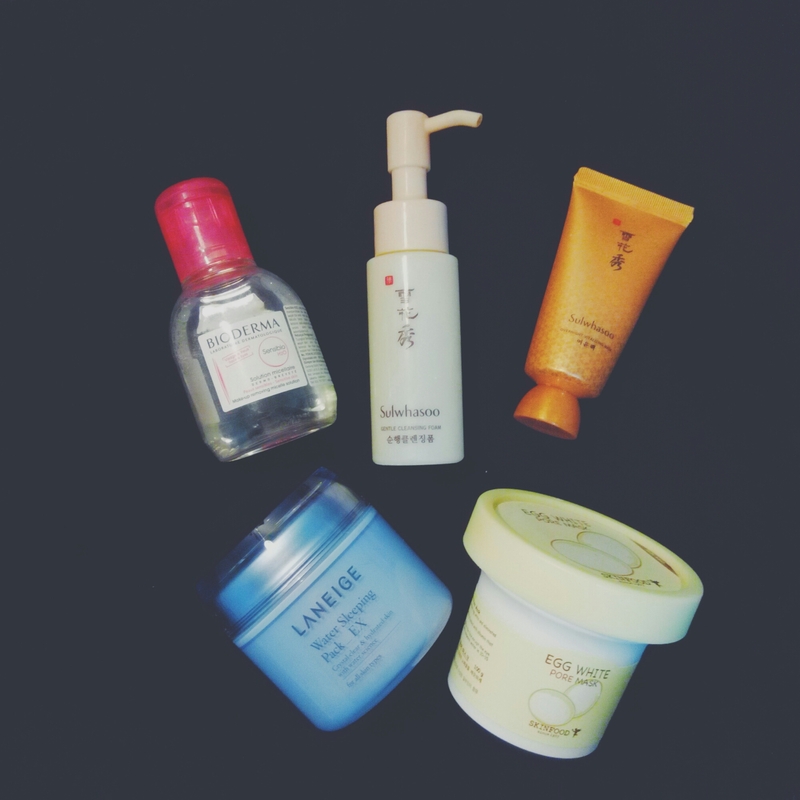 So, it’s a quite big thing for me when I finally decided to try many new products for my face. After almost a year of using several brands of skin care, I have finally found several brands/products that work for me and improve my skin conditions. I’ve initially wanted to make it as post series but I am too lazy, hahaha. So, I will just make a long post about several products and routines that don’t irritate my face. Sulwhasoo Overnight Vitalizing Mask. This is perfect for people who are too lazy to rinse the mask (a.k.a me). Put this one before sleeping and rinse it in the morning without cleansing foam. Works wonder. My skin feels moisturised and supple. The ginseng smell is also a win. I use it if I am too lazy to do my night tim skin care routine. Just clean the face and put this on, problem solved. Laneige Water Sleeping Pack EX. The same with previous mask. It’s a sleeping mask that gives intensive hydration, vitality, and brightening effect during sleep (that’s what it said on the packaging). Its texture is a bit gel-like. More hydrating than Sulwhasoo. This one also good to calm sunburn & irritated skin. Skinfood Egg White Pore Mask. This is a rinse-off mask, so I don’t use it too often compared with the previous ones. I have a problem with big pores and it’s for pore refining and unclogging. For toning, I use SKII Facial Treatment Clear Lotion. This one is used after facial wash. It removes dirt and dead skin cell. It prepares and helps the skin to absorb serum/essence. SKII Facial Treatment Essence. I’ve been using it on and off switching with other products, but this one wins my heart (it’s my second bottle). It improves my skin tone and texture. It doesn’t give an instant result (it takes months), but it doesn’t fail me. I use it day and night. SKII Facial Treatment Repair C. It can be use day and night. I only use it if I have time and don’t feel too lazy. It’s a serum to refine skin texture. It works wonder with Celluminatin Deep Surge EX, that sometimes when I wake up after sleeping with those combinations I feel like taking selfie, uploading it and giving a “I woke up like this” caption. Estee Lauder Advanced Night Repair. I’ve started using this two days ago and I’ve found no problem with it. I use it for spots control & radiant enhancement. SKII Cellumination Deep Surge EX. A gel-like cream that I used at night. It evens out skin tone and reduces dullness. Biore UV Aqua Rich. It’s a sunscreen with 50++ SPF and I swear it’s the best sunscreen I’ve ever found. The texture is very light and not greasy at all. It feels just right in my skin. It can be used for face and body, but I use it for my face and hand only. I use it every time I go out. SebaMed Lip Defense SPF30. Well, it’s actually for lips, haha. My lips are somewhat dry and sometimes a bit chapped. It works the best compared to other lip balms I’ve ever tried. 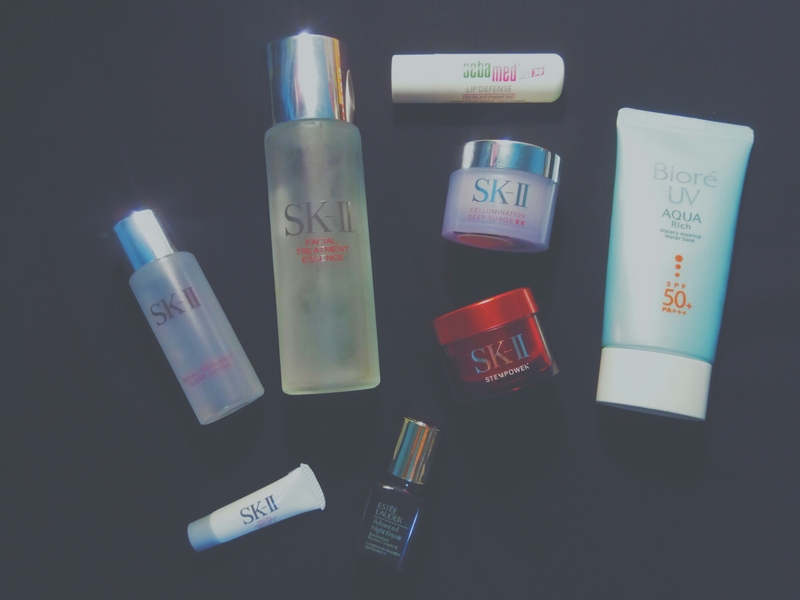 Mostly dominated by SKII products. For exfoliating, well, as my skin is very sensitive, I always reluctant to exfoliate it. Usually, exfoliating is using scrub or clay mask. I have tried several times and usually it resulted in disaster (rashes or redness). But, my friend let me try her Skinfood Black Sugar Mask and it worked well on my face. My skin felt clean and smooth with no redness and rashes afterward. I also like The History of Whoo Brightening Gel. It’s a chemical peel, so there’s no physical beads/scrubs that grind my skin. It effectively removes dirt and doesn’t cause redness to my face. 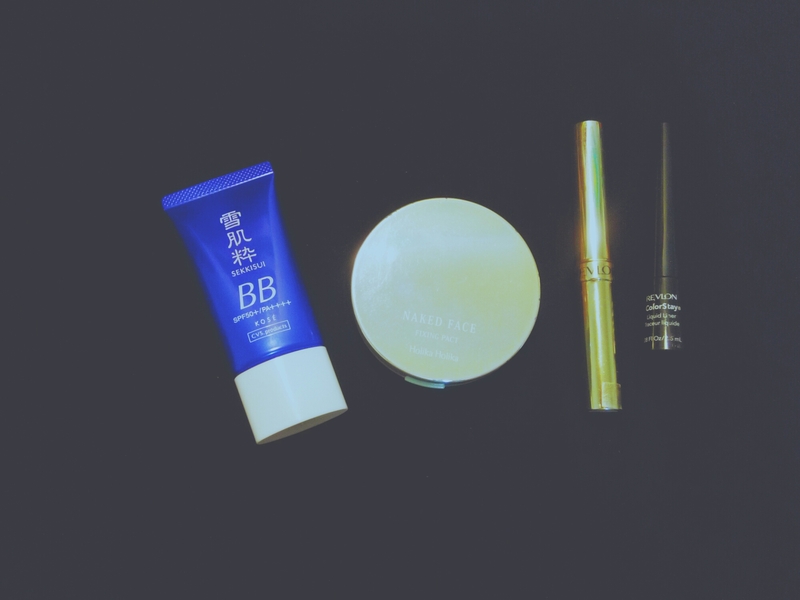 Kose BB Cream. I found this gem accidentally when I traveled to Nagoya last year. I left my Bodyshop BB Cream at my friend’s bathroom in Kyoto. Because at the time I relied heavily on Hada Labo Moisturiser and that BB cream to cover my blemishes, I felt uncomfortable without BB cream. As I strolled around 711 to buy something, I found this one and immediately bought it. And well, I’ve been in love with this thing since that time and I’ve repurchased it several times. Holika Holika Naked Face Fixing Pact. This is my first compact powder. Before this one, I didn’t use any powder at all. It gives a natural finished look and good for a simple daily make up. I admit I rarely use it even though I really like it (the laziness thing, again). Revlon Rose Berry 50. My first semi matte lipstick and I totally like it. I have several other lipstick, but this is the most favourite one. Easy to apply, great colour, and slightly minty sensation. Revlon ColorStay Liquid Liner. My first liquid eye liner. This one is easy to apply, but I am either too hurry or too lazy to put it on. So, basically, I’ve only use it twice to go out. Optional things beyond skin care. Well, it’s a quite long post and I actually never thought that I could write something like this, hahaha. I think skin care and make up products are something personal and give different effect to people. I am glad that I have some friends to talk about this matter and we’ve learned (and researched) it together (we have different problems and use different products). Currently, I only limit myself to skin care regime, because I don’t think I have patience and willpower to do make up stuffs. Sabun pembersih mukaku udah kupakai 5 tahun ini. Entah mereknya apa. Seriusan nggak tahu. Jadi ada sales yang jualan ke sekolahan ibukku trus nawarin produk kecantikan. Awalnya skpetis sih tapi surprisingly cocok. Dulu ada kirim siang-krim malam-dan gel pengerak kulit mati (apa sih istilahnya lol) di muka. Yang paling asik itu krim malam dan gel-nya (lupa mereknya). Krim siangnya agak nggak enak pakenya. Dulu itu aku jadi cantik *plak*. Tapi lalu semua kutinggalkan kecuali pembersih muka dan membuat mukaku kumus-kumus sepanjang masa. “Gel pengerak kulit mati” –> peeling gel. Dulu mukaku ga kenapa-kenapa walau diabaikan. Bersihin muka ya paling pake facial wash. Kalo keluar ya sekedar pake pelembab ponds. Tapi semua berubah sejak aku kerja. Walau indoor, tapi AC dan “debu”nya obat bener-bener bukin muka kerasa kotor. Ditambah kulitku tipe yang kering banget, jadi takut mau peeling. Bersihin muka pun males, sampe sekarang cuma pake facial wash. Paling kalo keluar rumah sekarang mesti pake pelembab plus sunscreen spf 15. Karena masih jerawatan kecil-kecil, apasih komedo ya, jadi ragu mau coba macem-macem. Dari dulu PR-nya ya nyari pelembab yg cocok. Gapapa, sesekali, kan. Kapan lagi bisa curhat urusan kulit di blog, hahaha. Wah, sama Kak, kulitku juga yg rewel gitu, di pipi kering tapi di daerah hidung sampai dahi minyaknya ampun-ampunan. Sekarang lagi parah-parahnya berjerawat, padahal dulunya juga nggak terlalu, paling cuma kalau lagi menstruasi doang 😦 Jadi sedih, Kak, huhu, udah coba ini itu yg ada malah bikin kulit makin nggak karuan. Apa iya sih Kak kalau lagi jerawatan nggak boleh pakai pelembab dulu? Soalnya ada yg bilang gitu sih, di internet. Haloo, setauku yah, berjerawat ataupun nggak harus tetap pakai pelembab. Tapi pelembabnya mesti disesuaikan dengan kondisi kulitnya. Saranku coba deh pakai Sebamed Mattifying Cream. Temanku ada yg berjerawat pakai itu sebagai pelembabnya dan sejauh ini cocok. Haloo, kalau sudah coba sana sini tapi masih belum menghasilkan, lebih baik percayakan saja kepada tenaga medis yang memang ahli dibidangnya. Misalnya saja dengan menghubungi dokter spesialis kulit dan kecantikan wajah. Masalahnya kondisi kulit tiap orang kan berbeda-beda, jadi jangan asal. Ntar malah hasilnya bisa kurang memuaskan. Gitu saran dari saya. Terimakasih. This blog has no particular theme. But mostly I write about daily tidbits, book, music, film, and travel.